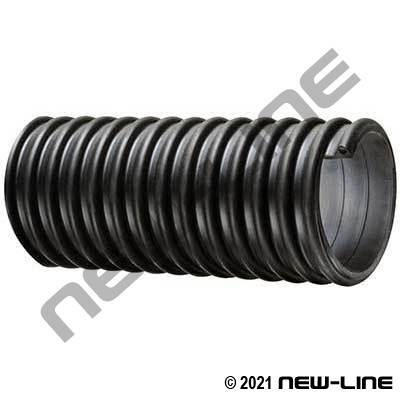 NL2100 is a lightweight, durable rubber hose that offers superior flexibility and a good "force-to-bend" radius over many other rubber and urethane material handling hoses on the market today. It has an "all rubber wall" which will gradually wear out providing more longevity, unlike urethane lined/tube hoses which can fail quickly once the relatively thin tube breaks down. As with many other material handling hoses, Tigerflex TR1 is designed for the transfer of a variety of abrasive materials (wet or dry). It has a smooth, static-dissipative, SBR rubber tube which eliminates material build-up in the hose and provides electrical conductivity. Its cover is highly resistant to UV and weathering. Typical Fittings: Insert type fittings can wear out prematurely with highly abrasive products; N675 right hand spiral clamps, N51 double bolt clamps. Note: Spiral clamps or N70-C202 strapping must be used for proper sealing with wet materials. Construction: Tube: Smooth SBR rubber. Cover: Corrugated SBR rubber. Reinforcement: Rigid, right hand (clockwise) PVC helix. Detail Comments: Service life of material handling hoses may vary depending on the operating conditions, hours of use, and the product being conveyed. Always rotate the hose regularly for even wear and inspect the tube for degradation before use. For other sizes refer to our NL8110 or NL8120 Material Transfer Hoses.